(Victoria, BC) – Yesterday, at the end of a 1 hour closed-door meeting with their lawyers, the CRD board took major steps toward protecting the region from urban sprawl. Having been overwhelmed with letters, phone calls and protests from people concerned about reckless development on the CRDs farms and forests, the board created a policy on how and when to pursue legal action against municipalities that violate the Regional Growth Strategy. The CRD board decided to change its decision making structure last month when it became apparent that the board had no jurisdiction to stop a five-person committee from approving the application to build 266 houses along 17 km of Juan de Fuca trail. Minister Ida Chong subsequently vetoed this decision, stating that the board already has mechanisms in place to stop the project. After hearing advice from their staff and lawyers the board determined this to be false and committed to meeting with the minister and the premier to re-submit their demand for a new voting system. At the start of the meeting the Dogwood Initiative unveiled a spectacular 3 metre-tall mural that over 200 people contributed to. 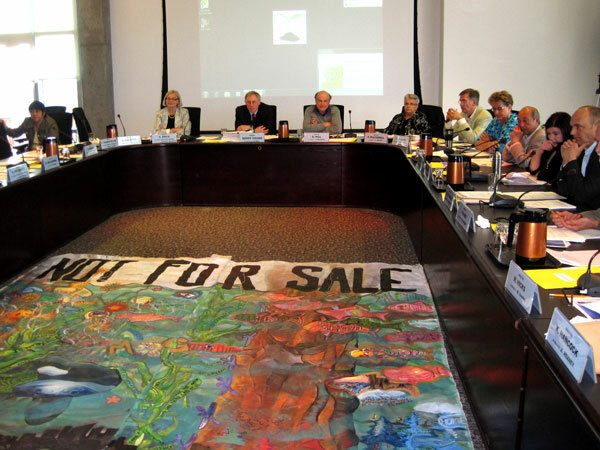 Titled Not For Sale the painting is a collection of statements and images about why the Juan de Fuca region should be protected from urban sprawl (Click on the picture below for a downloadable high resolution image).